I've been on a roll with recipes from my great-grandma Peggy. First there was her German Chocolate Cake with Broiled Coconut Frosting that was out of this world good. I mean broiled frosting!! You have to check it out if you haven't already. Then there was her Apple Crisp. I mean really, it is hard to go wrong with an apple crisp, especially this time of year. 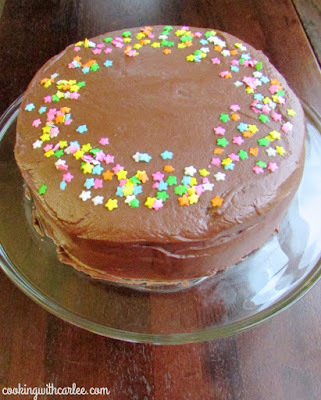 The funny thing this cake was the one I made first out of the three of them. This is MiMi's favorite birthday cake. The one from her grandma's recipe that was made for her as a little girl. The one she remembers, enjoys and still wants to have to this very day. So, of course I had to make her one for her birthday at the beginning of the month. I have gone back and forth a hundred times as to whether or not to share it. But I have decided to go ahead and give you the goods. I know, it seems silly. But there were a few reasons I was hemming and hawing all month long. First, this is one of those super special near and dear to her heart recipes that MiMi only recently shared with me. She wants it to be sacred and only served on her birthday... it is HER birthday cake after all. Secondly, I really didn't get any good pictures that do it justice. Third, I made the cake exactly how the recipe card was written. It was DELICIOUS. 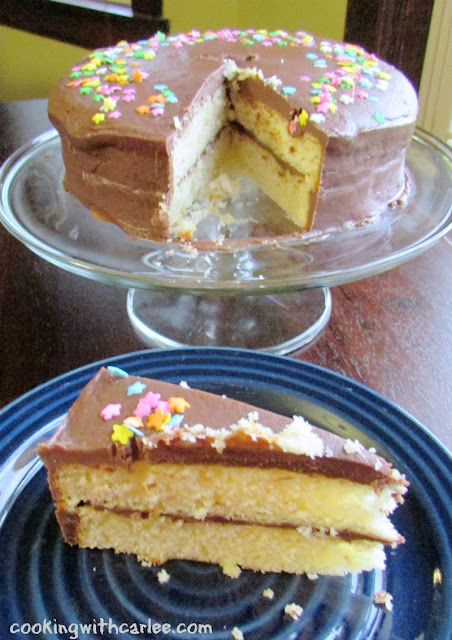 Dense and buttery with the fudgy frosting that MiMi had always talked about. But it was a bit squatty. Part of the issue was I used 9" pans, 8" would have probably scaled a bit better. When I mentioned it to MiMi, she said that her aunt had told her that they normally scale it up a bit to make it a taller cake. They make 1 1/2 times the amount called for in the recipe to give it more height. The funny thing is, once she said something about that it rang a bell. We must have discussed it when she got the recipe. Preheat oven to 375 F and prepare to 8" cake pans. Cream butter until smooth. Add sugar and blend. Add slightly beaten eggs and vanilla. Mix until smooth. Sift dry ingredients together and add to butter mixture, alternating with milk. Start and end with flour. Pour into prepared pans and bake for 20 minutes. Cool for about 5 minutes, then turn onto wire racks and cool completely. Melt chocolate and butter together in a double boiler until smooth. Remove from heat and stir in vanilla and powdered sugar. Add half and half or cream a bit at a time until creamy and spreadable. Spread over cake while warm. Thank you so much for making my special birthday cake. It was perfect and just the way I remember it. Now my grandma, my mom and you have made it for me. How fun is that? Fun for me- that is for sure. So glad you posted the rules. 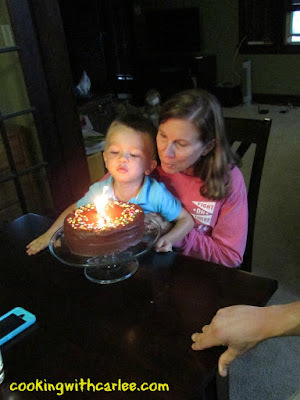 And Jaxon lined those candles up just perfectly so that we could blow them out quickly and get straight to eating it! He's becoming a pro at this birthday party stuff! I am glad you enjoyed it! Aww first of all, precious pictures!!! Seconds, I would want seconds, lol but secondly...I know this cake is delicious and all that love that goes into it!! Well, that just makes it all the more special!! Happy Monday and Happy Halloween beautiful!! Thank you so much, Andrea! And I hope you had a Happy Halloween as well! My best friend at work loves yellow cake with chocolate icing. I have to make this for her birthday! Thanks for sharing at What'd You Do This Weekend. This would be great for her then! Thanks, Linda! I love that you are working with the family to record all the recipes that have been held dear and that you are documenting them to pass on. My Gran and I would make these muffins, we called them Softies. They were the best! We would make them together, it was our thing, before family dinners. Now that she is gone no one has the recipe or knows how to make them. I miss that. And that the passing on, the family tradition, has ended. Makes me miss her more. Happy Birthday to Mimi. I want this to be my birthday cake too! 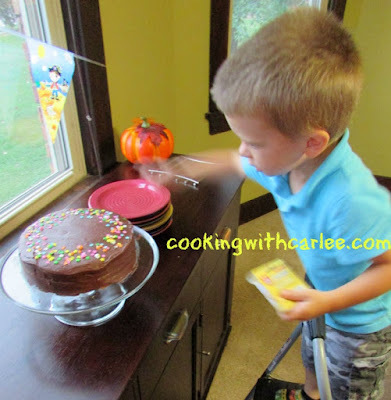 French butter cake and chocolate frosting? Oh yeah! Delish! Oh man, I wish we could all know what was in softies now! We love to make muffins. I have been really enjoying making all of these family recipes. Some I grew up with, others are new to me but make me feel connected to my family's past. I wish I had recipes that were handed down through the family but, sadly I don't. I'm glad you're ensuring this happens in yours. Thanks for sharing with us at Funtastic Friday! Thank you! It has been fun making recipes from my great-grandmas and sometimes even further back than that. I have been really enjoying some of these older recipes. Too funny that you don't even like the one from your grandma! At least your mom is filling the gap. Thanks, Jessica! Your recipe is featured on Full Plate Thursday this week. Thanks so much for sharing it with us and enjoy your new Red Plate! Thank you! My mom appreciates you following the rules! Wow. I just love all types of cake.Really its a nice blog for Birthday cakes.I really appreciate with your choice.